I’ve been on a bit of a health kick this year. I want everything that goes into my body to be doing it some good. If it tastes good, that’s an added bonus. PRE Probiotic liquid Enhancers fit into both categories. Firstly, I can only tell you from personal experience about the taste because I’m not able to measure how good it is for my body, on my own. I’ll tell you what it’s supposed to do, though, and it sounds pretty amazing. 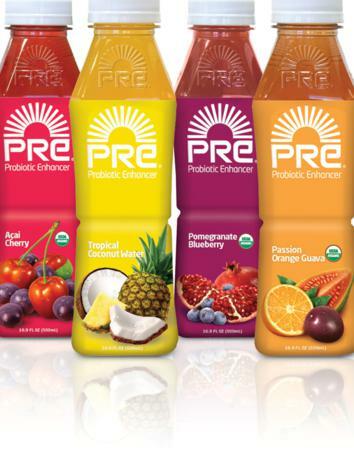 PRE Probiotic Enhancers are organic juice fusions, enhanced with prebiotic fibers, which feeds and supports probiotics. They’re designed to strengthen digestive health. People of all ages can drink it. Just to give you a better idea of where your probiotics are coming from now, you can find them in yogurt, fermented milk, and soy drinks. If you can’t stand dairy products (I go through phases of this), this drink is an easy, on-the-go solution for you. Most women know that yogurt helps produce beneficial bacteria that helps limit the growth of harmful bacteria. It can also lead to improved vitamin absorption. PRE Probiotic Enhancers should provide you with these same benefits. I’ve been drinking it as a replacement for my glass of apple juice at dinnertime and it is just as yummy. When I got a sample to try, I loved the taste. Its light and refreshing, which is perfect for these blazing summer days. I tried all three flavors and loved them all. If I had to choose, though, my favorite would be the Tropical Coconut Water. It reminds me of the beach. PRE Probiotic Enhancers are designed to be a supplement to a healthy lifestyle. The same way you would incorporate exercising 3 times a week to your schedule is the same way you would with the PRE Probiotic Enhancers. PRE Probiotic Enhancers are available at Whole Foods, Albertsons, Bristol Farms, Ralphs and all over Southern California.